In this Christmas Spirit, I’m presenting NORAD tracking Santa, their history and their media focus. Enjoy! The program is in the tradition of the September 1897 editorial “Yes, Virginia, there is a Santa Claus” in the New York Sun. 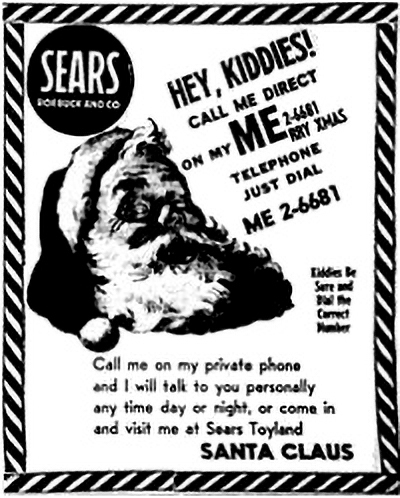 The program began on December 24, 1955 when a Sears department store placed an advertisement in a Colorado Springs newspaper which told children that they could telephone Santa Claus and included a number for them to call. However, the telephone number printed was incorrect and calls instead came through to Colorado Springs’ Continental Air Defense Command (CONAD) Center. Colonel Shoup, who was on duty that night, told his staff to give all children that called in a “current location” for Santa Claus. A tradition began which continued when the North American Aerospace Defense Command (NORAD) replaced CONAD in 1958. NORAD relies on volunteers to make the program possible. Each volunteer handles about forty telephone calls per hour, and the team typically handles more than 12,000 e-mails and more than 70,000 telephone calls from more than two hundred countries and territories. Most of these contacts happen during the twenty-five hours from 2 a.m. on December 24 until 3 a.m. MST on December 25. Google Analytics has been in use since December 2007 to analyze traffic at the NORAD Tracks Santa website. As a result of this analysis information, the program can project and scale volunteer staffing, telephone equipment, and computer equipment needs for Christmas Eve. 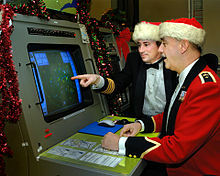 The NORAD Tracks Santa program has always made use of a variety of media. From the 1950s to 1996, these were the telephone hotline, newspapers, radio, phonograph records and television. Many television newscasts in North America feature NORAD Tracks Santa as part of their weather updates on Christmas Eve. From 1997 to the present, the program has had a highly publicized internet presence. As mobile media and social media have become popular and widespread as methods of direct communication, these newer media have also been embraced by the program. The layout of the NORAD Tracks Santa website and its webpages have changed from 1997 to the present due to changes in internet technologies, and changes in partners and sponsors for a particular year. 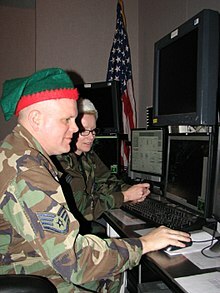 Between 2004 and 2009, people who visited the NORAD Tracks Santa site were told they could “track” Santa in Google Earth. They were given a link to download Google Earth, and then a KMZ file to download. Since 2009, the tracking in Google Earth has been done from the NORAD Santa site, and there is no KMZ file for Google Earth anymore. From mid-January until November 30, when one arrives at the NORAD Tracks Santa website, one is greeted with a message to come back on 1 December to “track Santa with NORAD”. During December, one finds a NORAD Tracks Santa website with all the features available. On Christmas Eve, the NORAD Tracks Santa website videos page is generally updated each hour, when it is midnight in a different time zone. The “Santa Cam” videos show CGI images of Santa Claus flying over famous landmarks. Each video is accompanied by a voice-over, typically done by NORAD personnel, giving a few facts about the city or country depicted. Celebrity voice-overs have also been used over the years. For the London “Santa Cam” video, English television personality and celebrity Jonathan Ross did the voice-over for 2005 to 2007 and the former Beatles drummer Ringo Starr narrated the same video in 2003 and 2004. In 2002, Aaron Carter provided the voice-over for three videos. The locations and landmarks depicted in some of the “Santa Cam” videos have changed over the years. In 2009, twenty-nine “Santa Cam” videos were posted on the website. In previous years, twenty-four to twenty-six videos had been posted. Well, Santa is an Apple fan.